On July 12, 2018 (Thursday), Wedge Holdings Co., Ltd. (JASDAQ: 2388) (Headquarters: Chuo-ku, Tokyo, Representative Managing Director and CEO: Mr. Tatsuya Konoshita) held an award ceremony for "Illustrator Contest Asia". In this ceremony, awards were given to creators of 6 excellent works from those who participate in "Illustrator Contest Asia" which was held in Mongolia, Thailand, Vietnam and Indonesia last year. The awarded creators were invited to Japan. In this event, Manga Artist and Illustrator, Mr. Akira Ito who served as judge for "Illustrator Contest Asia" presented the trophy to the creators. Mr. Ito also said "As a professional, other than drawing what you like, it is also important to draw things that can make people happy. I look forward to working together". Based on the philosophy of "The Gate to the World for Asian Talents", this contest was held with the aim of discovering talents from every corner of the world and help them to grow. Throughout all 3 competitions, we received more than 1,400 illustrations, and 13,000 votes. From all those applications, 27 works were selected based on their votes from each country and chosen by the judges. 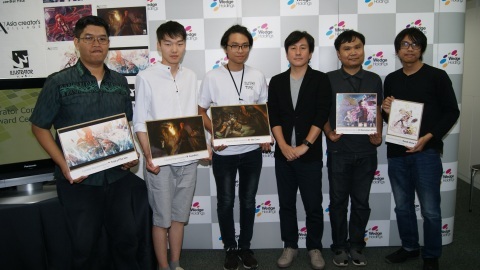 Among them, 6 works were given special awards on "Illustrator Contest Asia Championship". In this contest, we received many applications and votes that make us realize that Asia still have lots of hidden talents and people who love entertainment. Thus, our company will continue to contribute for the development of Asian entertainment industry. Our company will give maximum support to all creators who were awarded in this competition. As one of the rewards, the awarded creators were invited to travel in Japan from July 12 to July 15 for a 4 days 3 nights Trip. During their stay they went to Akihabara, Asakusa and many other spots to experience Japanese Culture, and also several special illustration events. They attended lesson tour for 2D illustration at "Vantan Game Academy" (http://www.vantan-game.com) that was operated by Vantan Inc. Also visited editorial department of Shueisha Co., Ltd. (https://www.shueisha.co.jp) and joined the gathering party with fellow Japanese creators to exchange information and circumstances about illustration in Japan and Asia. They also went to Communication Bar “TCG” that has the image character and logo designed by Mr. Ito (http://www.tcg-web.net/) and drew the female voice actress cast as well as an illustration for their menu. Those drawings will be laminated and shown at the shop. Through this trip in Japan, we were able to confirm that there are many chances for overseas creators to participate actively in Japanese company. In the future, we hope to become the bridge between entertainment in Japan and Asia by promoting these overseas creators in various occasions. Our Entertainment content business will further focus on Asia, and act as the "Anywhere door" for Asian entertainment. As a starting point, our company will localize trading card game "Haikyuu!! Volley Ball Card Game" by translating them into the local languages in Vietnam (September 2018) and Indonesia (December 2018). Thank you for holding this contest and giving us a chance. Various experiences with Japanese culture make me feel so moved and surprised. It is a very wonderful trip. If any chance in future, I would like to work in Japanese Game Industry. I am very grateful to all who organized this contest. This is my first time visiting Japan, and I am actually quite scared because I can not read any Japanese at all. But everyone is very nice and I am having a really good time. I hope I can visit Japan again and see more places. In the future, I would like to see my manga all round the world. I am very pleased to be able to come as a Mongolian representative. I would like to give my gratitude to the sponsors, judges and people who voted for me. This trip to Japan is so far my best trip I ever had. I am very surprised at how Japanese respect each other and think that it is very wonderful. It was really a nice experience for me because I always wanted to visit Japan. I have a dream to make a motion comics and will work hard to achieve it. I am glad that I could participate in this contest. I admired Japan very much, so this trip is like dreams come true for me. It was a very nice experience to be able to see the actual classes at a vocational school. The Suginami Animation Museum was also very exciting for me. I get to know a lot of things and gain some experiences. Using all of those experiences, I will try to make illustrations that can make you feel passionate. I never even dreamed to get a special prize. Thank you so much for choosing my illustration. I was very happy to be able to visit Japan. I learned so much from meeting the illustrators and mangaka in this trip. In the future, I want to draw illustrations that can attract the Japanese interest, and do various illustration works including trading card game. Seeing the illustration skills from each country makes me realize that there are many great illustrators in this world. This contest has really broaden my view. I really thank the host of "Illustrator Contest Asia" for giving me a chance and great experience.